Observation - Ballerina Waxcap (Hygrocybe calyptriformis) - UK and Ireland. 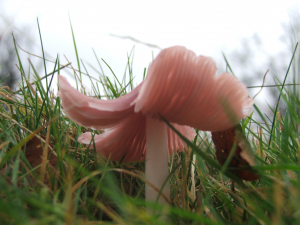 Description: Pink ballerina waxcap growing in sheep-grazed grassland pasture beside a small beck/stream. Pink ballerina waxcap growing in sheep-grazed grassland pasture beside a small beck/stream.